This report investigated the development of production technology for Black Tiger Prawns (Penaeus monodon) to increase production efficiency and reduce sediment and nutrient discharge from prawn farms. 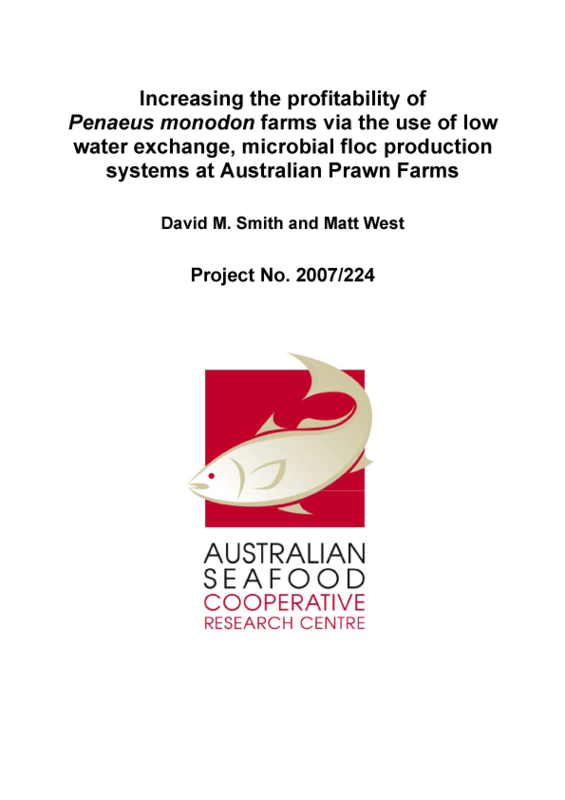 Australian Prawn Farms Pty Ltd (APF) previously did some preliminary trials using a low water exchange system, with promising results. Low water exchange or discharge systems rely on microalgae, bacteria and other microbial organisms to recycle the nutrients, particularly ammonia, from the waste that is generated in a pond. The microbial community can aggregate to form small clumps commonly termed bioflocs. The formation of bioflocs tends to reduce variability in the concentration of nutrients and enhances the stability of pond nutrient and chemical dynamics. Prawns thrive in the biofloc environment, exhibiting increased survival and growth rates. This study investigated the key nutrients involved in the development of the biofloc in a prawn pond and the effectiveness of different carbon sources for microbial floc formation. The nutritional benefits of microbial flocs to P. monodon reared in ponds were determined and the associated reduction in feed costs was quantified. The low water exchange, biofloc system at APF resulted in a 30% decrease in total feed costs, a 70% reduction in water exchange and a 77% decrease in nitrogen discharge. The use of the new production system at APF also resulted in a significant increase in the harvest yields of prawns. APF estimate that if they had still been using a conventional flow-through system in 2008/09, they would have produced about eight tonnes of prawns per one hectare pond compared to 12 tonnes of prawns per one hectare pond using the low water exchange, biofloc system. Taking all the additional costs and savings into consideration, the biofloc system can therefore increase the production from each pond by an estimated $65,000. On the basis of these results and the system management experienced at APF, four additional farms are either using the low water-exchange system in the 2010/11 season or are preparing to implement this system in the future. In May 2010, Sunshine Coast TAFE ran a strategic planning workshop for farm owners and managers to equip them to make decisions about adopting this type of production system using the information generated by this project.